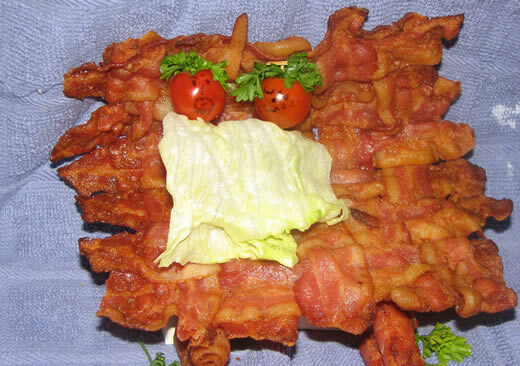 Welcome, everyone, to the world’s first and best Bacon Mat gallery. 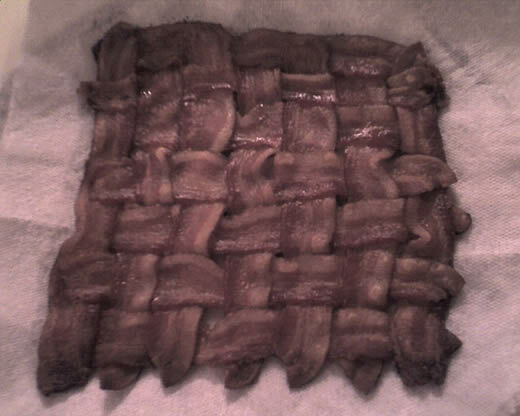 We first learned of the magnificent idea of weaving meat from instructables.com. Whoever came up with this deserves a knighthood. Send us your photo and we’ll add it! Lauren’s first mat: I was uncertain about how long to cook it, so it was a little soft. We cut it in triangles because we were just eating it, not making BLTs. My second and third mats. I wasn’t as fearful this time around. My brother Mark’s first mat: NOTE: He is displeased with the poor quality of this photo, taken with a camera phone. For a more mouth-watering submission from him, scroll down to the bottom of the page. We made our very first BACON MAT!!!!!! 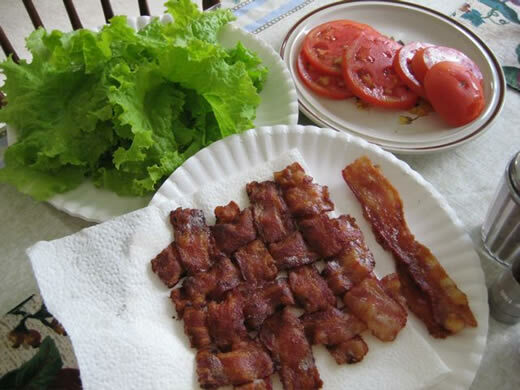 The BLT’s were delicious, but I shoud’ve cooked the bacon a bit longer and also tried to drain more of the fat off as it cooked. Love you (just because, but also because you’ve taught us something new!)!! The bacon she had was shorter than what she normally buys, so we cut the mat in two and it covered the wider slices of bread we get nicely! 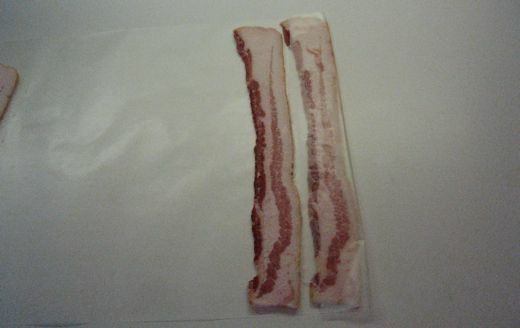 Double layer of bacon! Yum! Oh, the lettuce is from her garden. We bought the tomato, though. For Mark: this picture was taken with a mere 7.1 megapixel Canon SD1000. 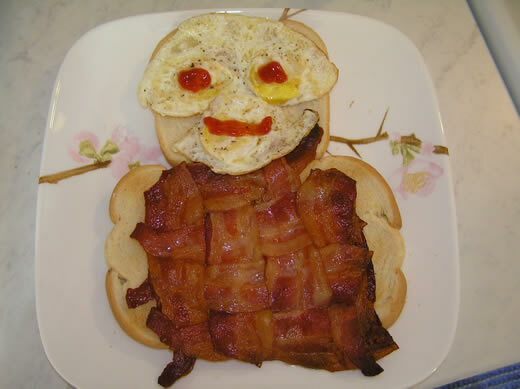 Dad will probably be sending a picture of my bacon mat. 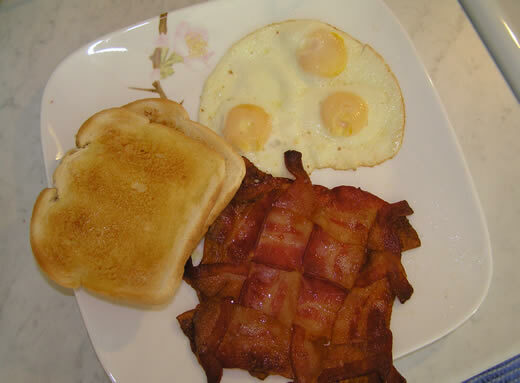 I only use center cut bacon, which is shorter, – so 4 strips across, 4 strips down, – cooked slowly on top of the stove and only flipped once. Cut it in half and we had two sandwiches. Worked great! I fried this little mat. It worked just fine. It’s just the right size for the bread (which is underneath in the picture.) I also painted the pig about 10 years ago. The regular size mat, with love. 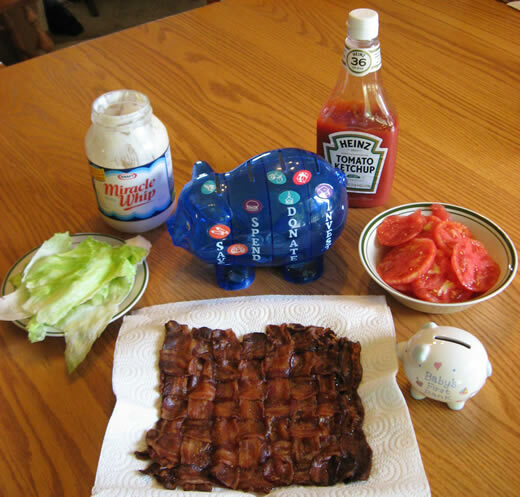 Kristi’s bacon mat and BLT fixin’s, but I don’t know what that ketchup is doing there. 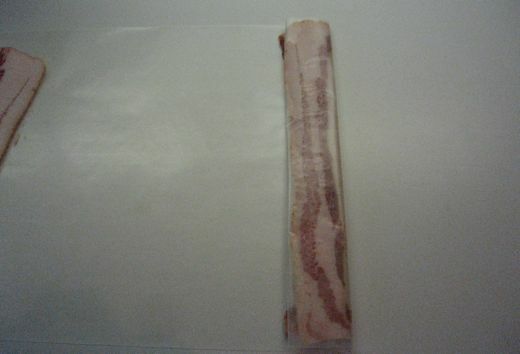 This is farm-fresh bacon. The bacon was butchered in June and was delicious!!!! These bacon mats are made with Center Cut Bacon, so they are smaller. That makes them go well with the tiny Bantam Chicken eggs my neighbor gave me. I chose a more traditional arrangement. Denis was more creative. I think this might be your track to internet fame! 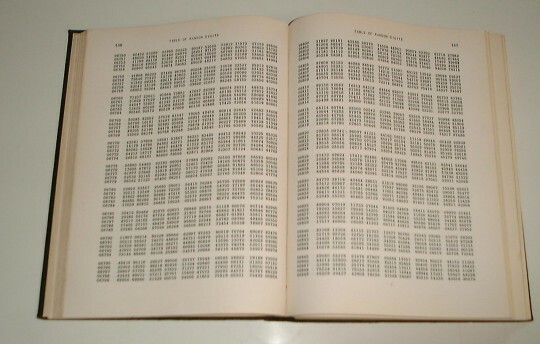 A few more pictures and you could submit the link to boingboing or neatorama! We tried it. And, contrary to popular opinion, we didn’t like it so much. Perhaps it was baking it on a stone instead of a pan; perhaps it was something else; perhaps we just like our bacon in strips. Has anyone else baked it on a stone? Or did you all use pans? 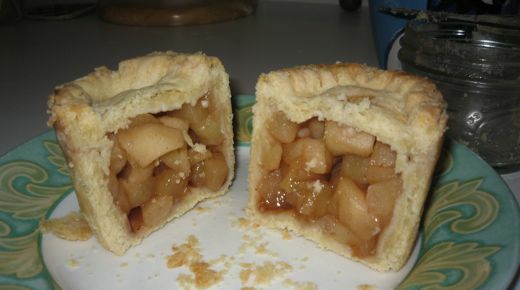 The convenience of having sandwich sized pieces was nice, but not worth the variation in baking. Our middle wasn’t crispy enough, though the edges were good. 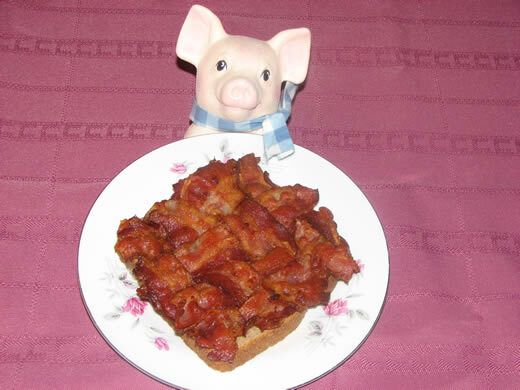 Harold is a “Bacon is bacon” kind of guy, but I’m more selective, I go for the crispy bacon. Mark & Rachel’s updated photo! 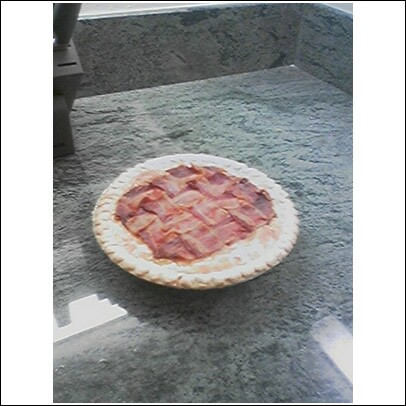 I would respectfully request that the pitiful and unappetizing picture of our first bacon mat, posted in the Bacon Mat Gallery, be removed and replaced with the attached photograph, along with a comment that the camera used makes as much difference as does cooking the mat the right amount of time. 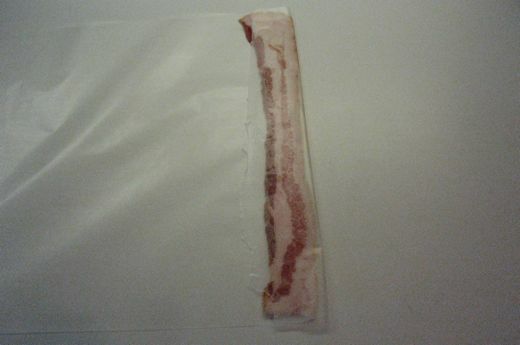 Another comment, I think the next time we’ll try to use thick-cut bacon. The scrawny little piece all the way on the left was paper thin, and shriveled up to almost nothing. This one was done on a baking stone, and Beth is right. The outside gets crispy way before the inside. It also helps if you cut it into sections before it gets cold, but while its still just a little warm. I see we’re getting some hits from Reddit, and I thought this might be a good time to share a little bacon-freezing tip I learned. This is NOT my invention, I learned it from here, and their pictures are much less blurry and more well-lit than mine. 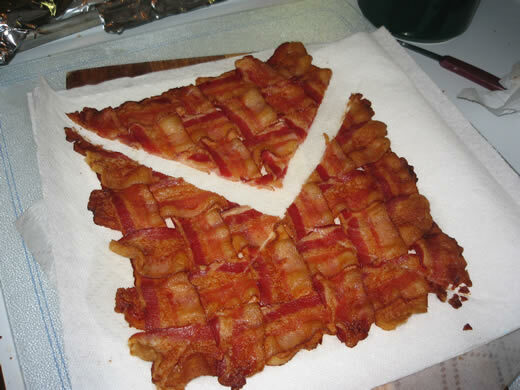 Anyway, if you find yourself with extra bacon on hand and aren’t going to make another mat anytime soon, this is a great way to freeze it so you can pop off individual slices. 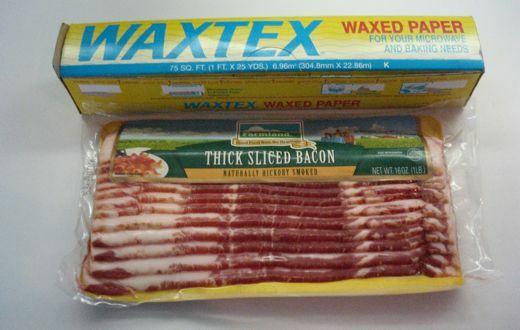 Start with your bacon and some waxed paper. 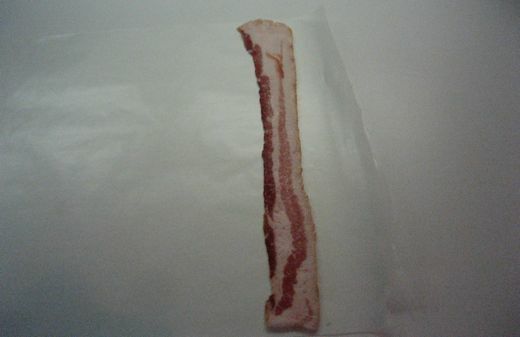 Put one slice a bacon-width from the edge. 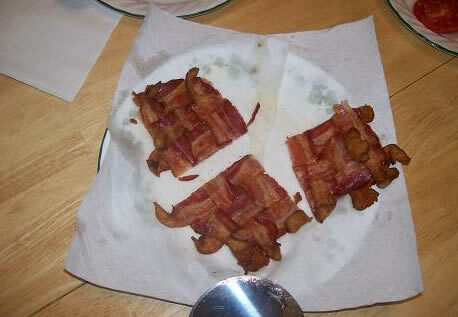 Fold the edge over and cover the bacon. Put another slice beside it. Another slice, lather rinse repeat until you’re out of slices. Wrap the whole shebang up in plastic wrap or foil and freeze. When you need a slice or two, just unroll. It’s like magic! 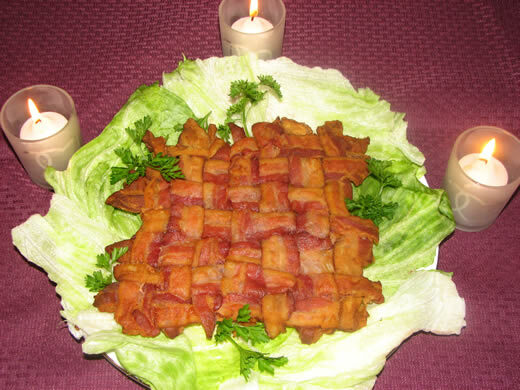 Happy Baconing, everyone. Thanks for stopping by. Even though this wasn’t submitted, I StumbledUpon this and it made me spit out my coffee with laughter (always a good thing). 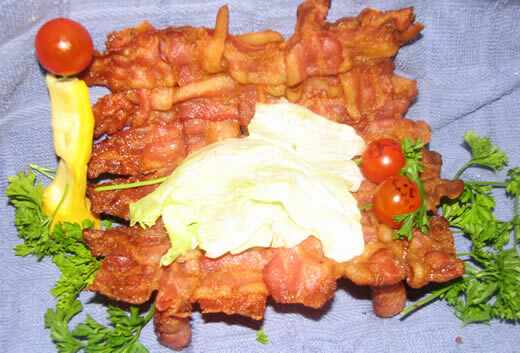 Yes, it’s a Bacon-Cheese Roll. 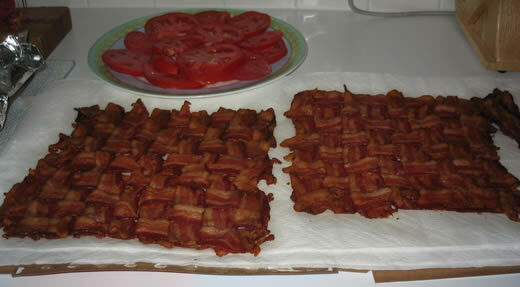 This makes me really hungry for a BLT…brilliant! After you knit me some money, make me one of these, ok? Karla, how did you EVER find such a thing!??!! 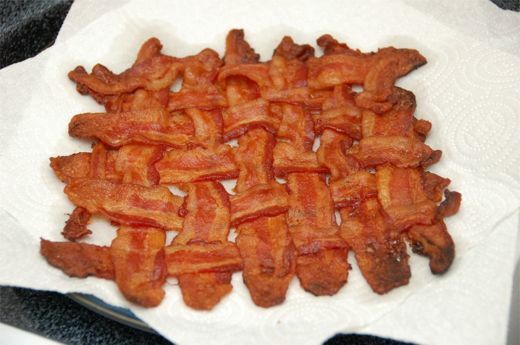 I have to make a bacon mat now. Thanks for all the pictures! 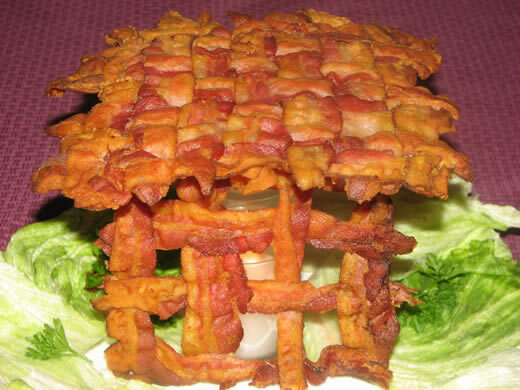 Thanks for letting me know about this site -- love the bacon mats! You people are just crazy. Love it!